Equipped with a high-performance NVMe interface and a Polaris controller, this SSD delivers blistering fast read/write speeds of up to 3,200 MB/s and 1,900 MB/s respectively. Plus, Samsung TurboWrite technology creates a high-performance write buffer area whenever a write operation is underway to accelerate write speeds even further, making the 960 EVO ideal for gaming, data analysis, graphic and sound design, and other demanding applications. Backed by a 3-year limited warranty, the 960 EVO offers exceptional lifespan and data security, boasting an endurance rating of up to 400 TBW (terabytes written). It also features Dynamic Thermal Guard, a technology that automatically throttles the drive's temperature when it approaches dangerous levels to reduce the risk of overheating. 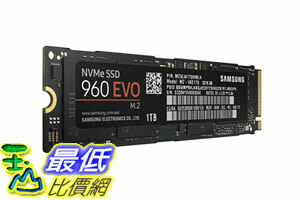 The 960 EVO comes with a free download of Samsung Magician software, an advanced software solution that allows you to easily monitor, manage, and maintain your SSD. Magician helps ensure that the SSD firmware stays up to date and offers a range of additional functions that allow you to tailor settings to best suit your usage.